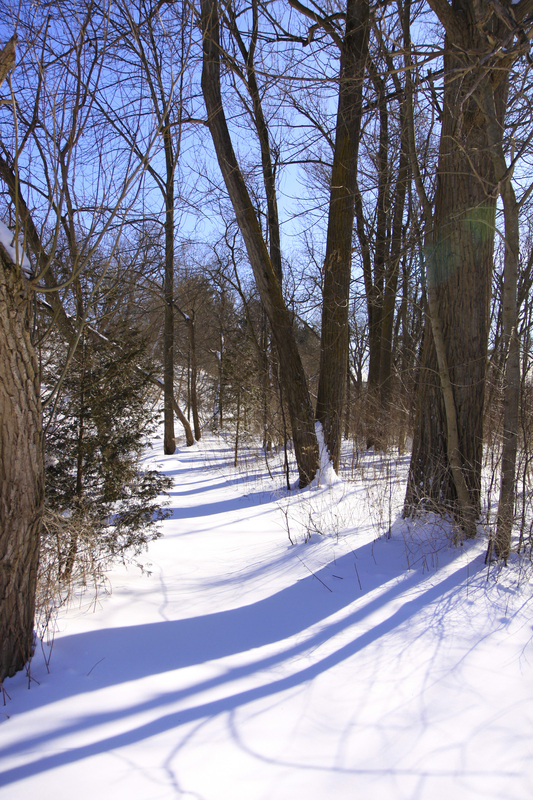 Our weather has recently taken a small turn for the better but in the spirit of being way behind in my photo sharing, this post was written several weeks ago when I was exceedingly tired of the enduring winter weather. 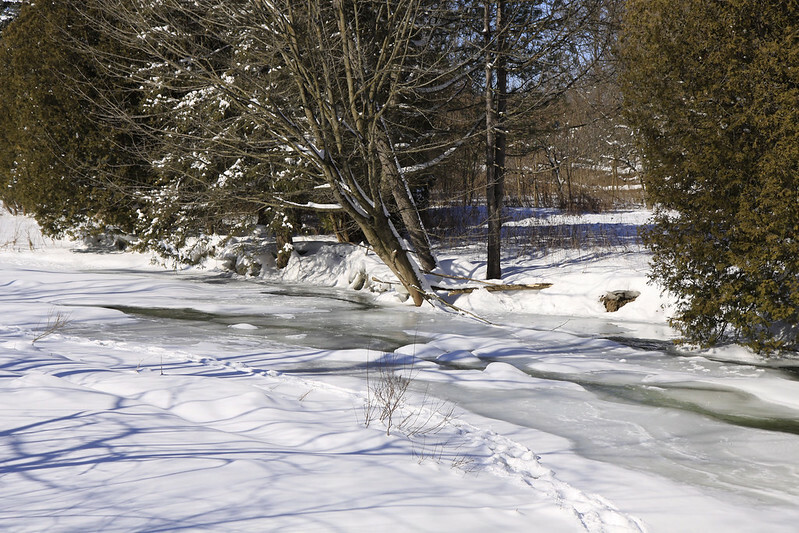 It seems that through winter, there's only so much out there worth photographing. Sure the snow and icy surroundings can look nice - for the first week or two but after that, the season seems to wear thin pretty quickly. 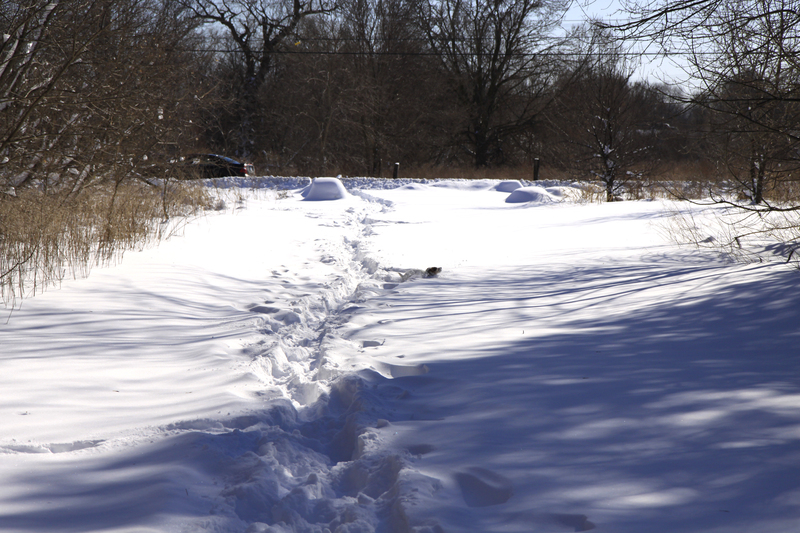 The one nice thing about winter is that the sun always seems to be at a low angle - never directly above as in summer. 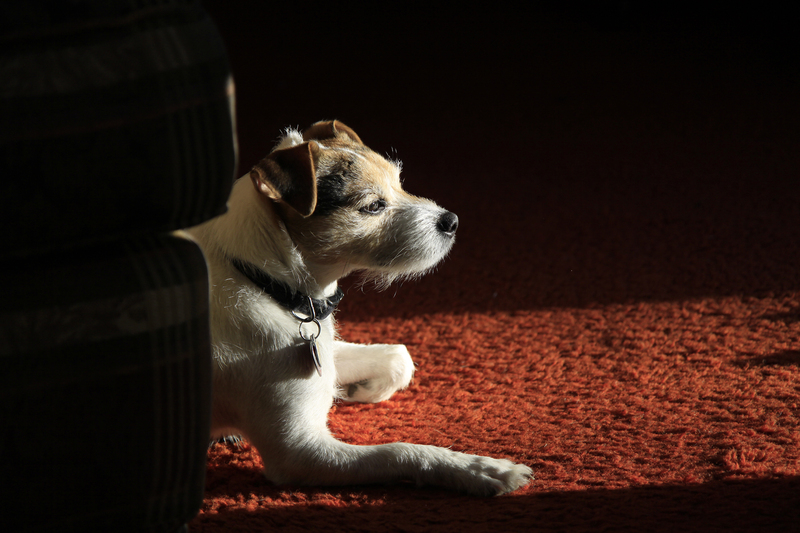 This makes for lovely lighting and intense shadows. On this day, I spent a lot more time snapping photos indoors than out. Below are a few plants around Frank's house. 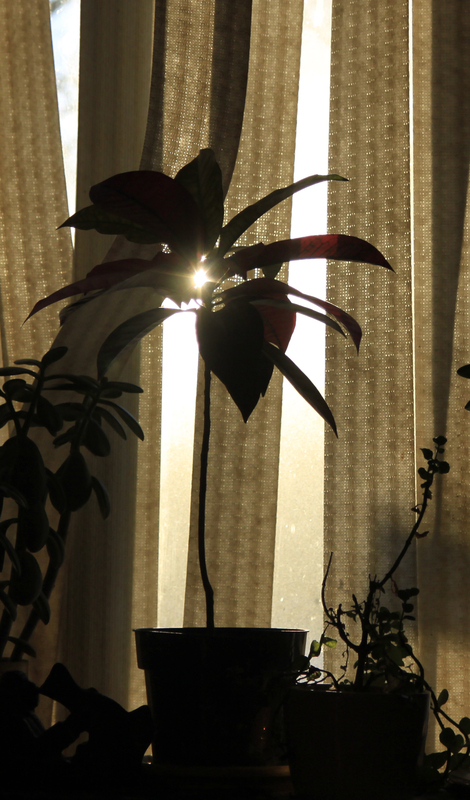 The sun was shining through the kitchen window where a couple of plants adorn the ledge. 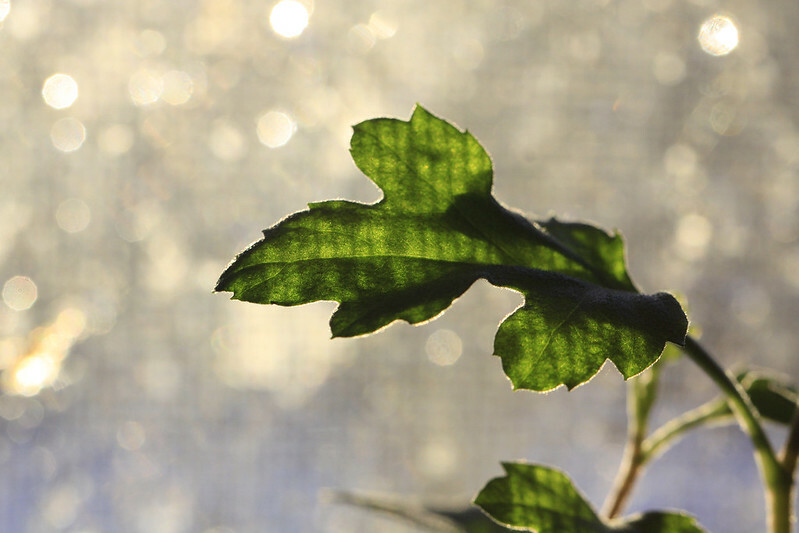 Its light was so intense, that it cast shadows of the window screen upon the tiny leaves. 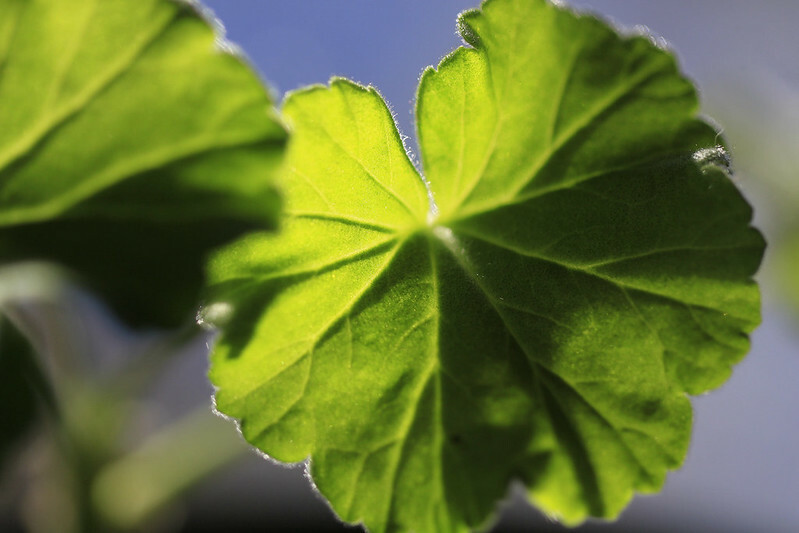 Another plant, backlit by the sun. 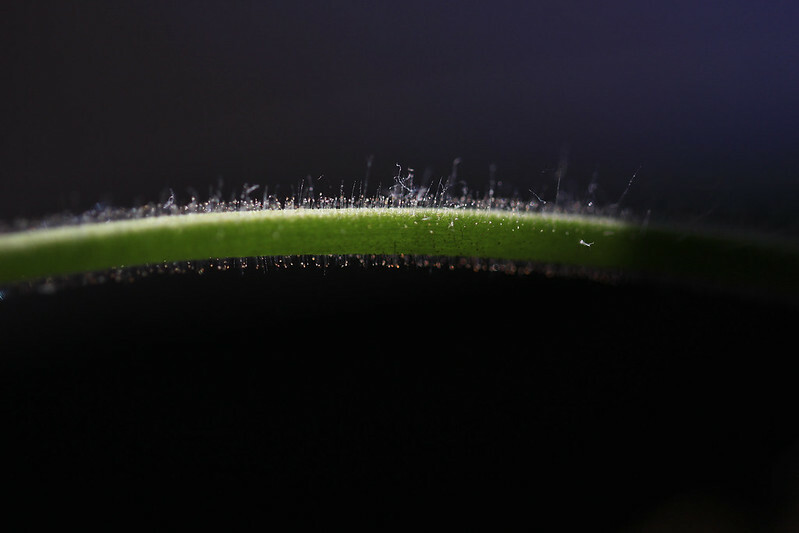 The tiny hairs on the stem of yet another plant were illuminated. 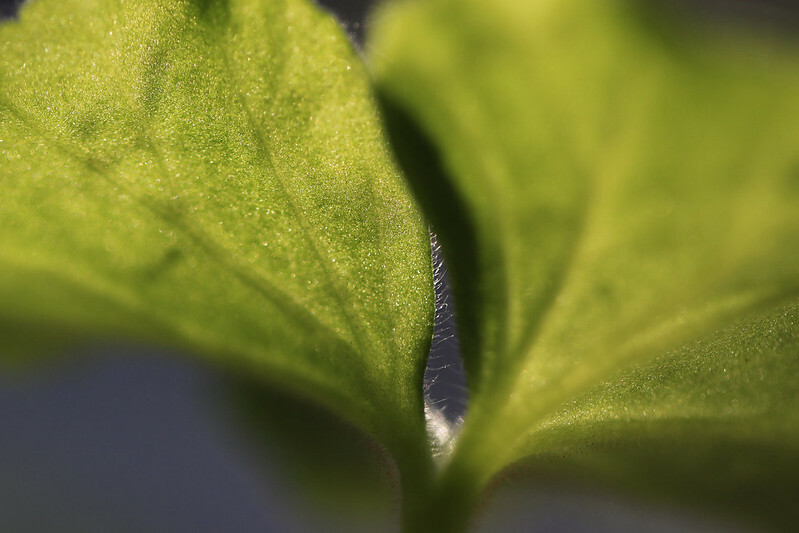 Same plant - a peek through its leaves. 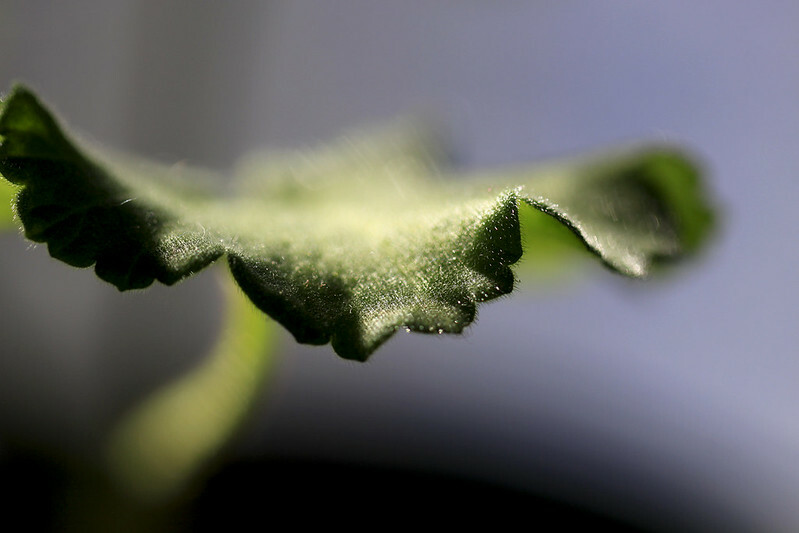 A different view of the same leaf. Do try and contain your excitement. 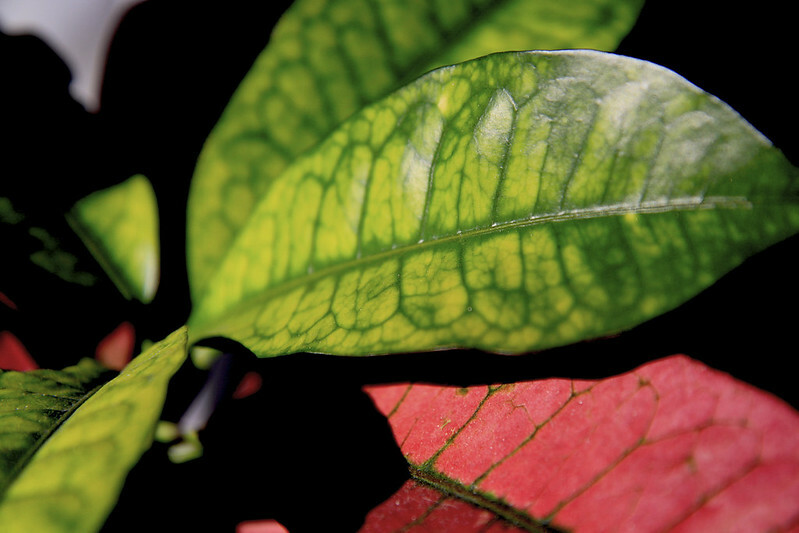 The croton is a colourful plant - often showing off greens, reds and yellows at the same time. 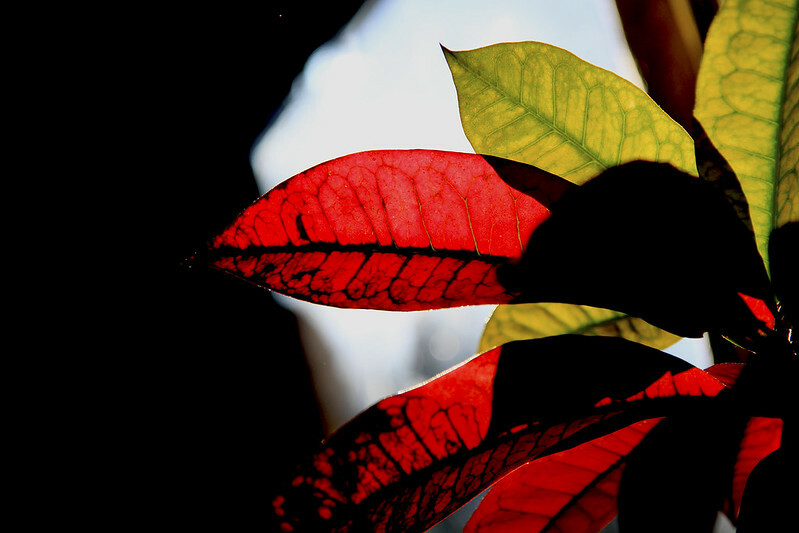 Sunlight is peeking between the leaves. Another day, another view. 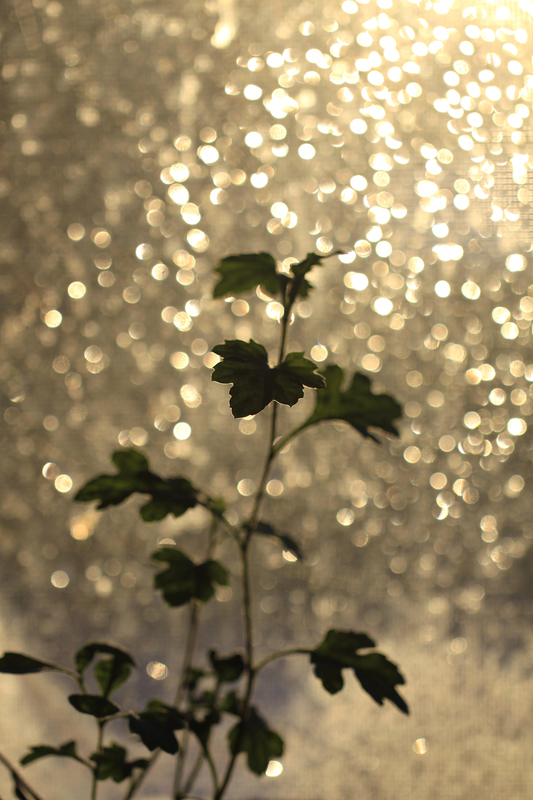 The light shines directly on the leaves. And from behind, it shines right through them. 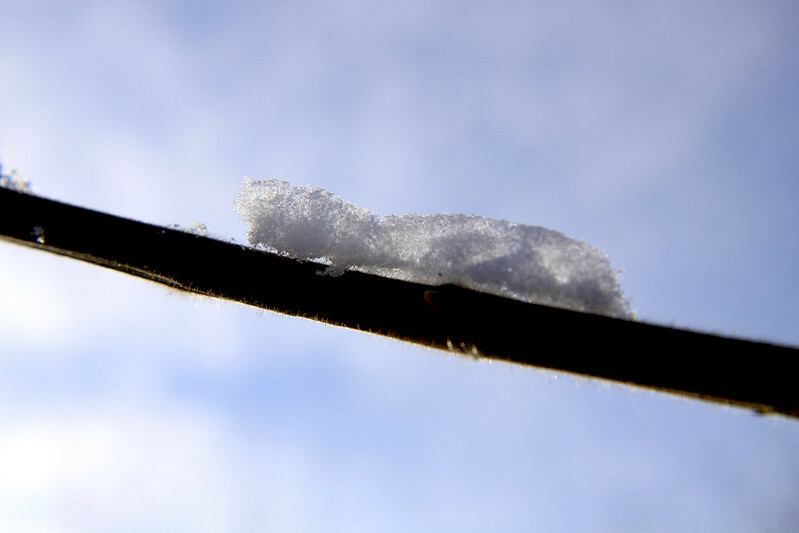 Fresh snowflakes, sunlight and the window screen were responsible for this bokeh effect. 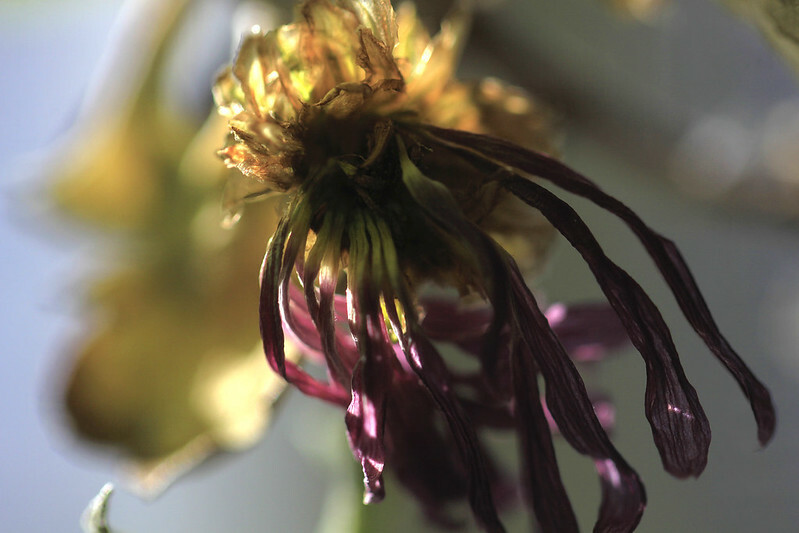 Even dead blooms have their beautiful moment in the sun. Wishing those who celebrate a Happy Passover and/or a Happy Easter. Whatever you acknowledge, just make sure the Easter Bunny doesn't Passover your house without delivering some chocolate. There's always something interesting to see while out walking. Here are just a few of them. 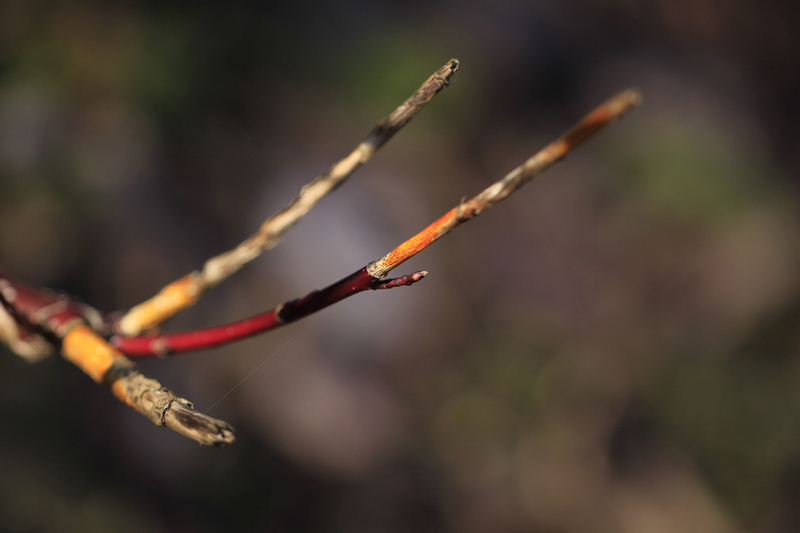 A stripped down twig shows off some brilliant colours in the late day sunshine. 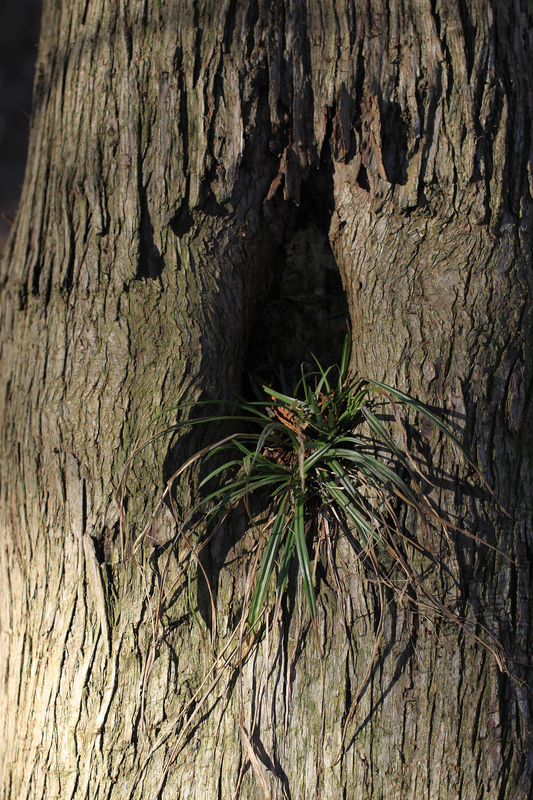 An unusual bit of greenery during a warm stretch in January. Red stands out like no other colour in the drab or snowy season. 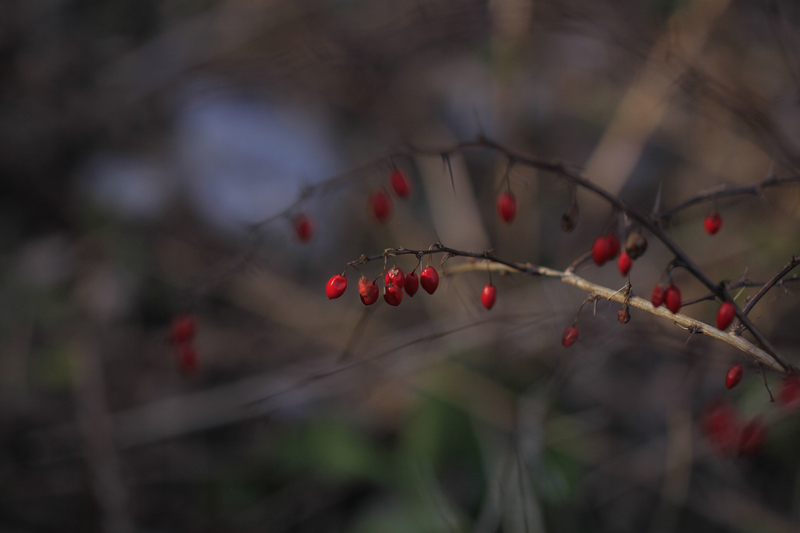 These Hawthorn berries were difficult to snap on this windy day. 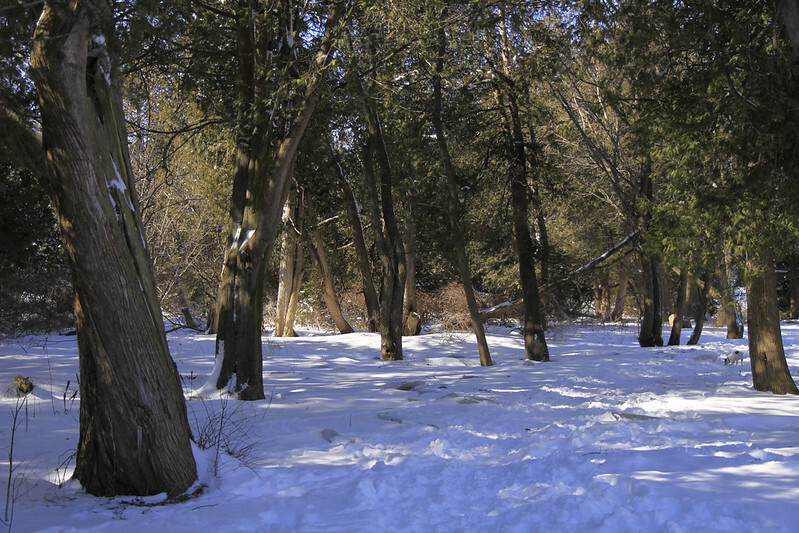 One of my stops along the path is this cedar tree where I leave a peanut or two for my furry pals. If you squint, you might see one coming to collect it. OK, forget the squint. He's come into a bit better focus. Several of these cuties are ready for my approach every day. 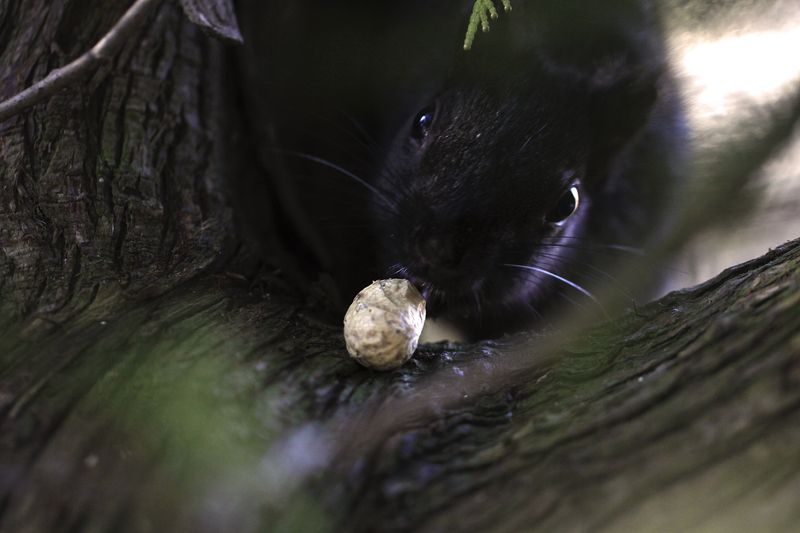 They see Benny and me coming, and they start hopping branches to get over to this tree. 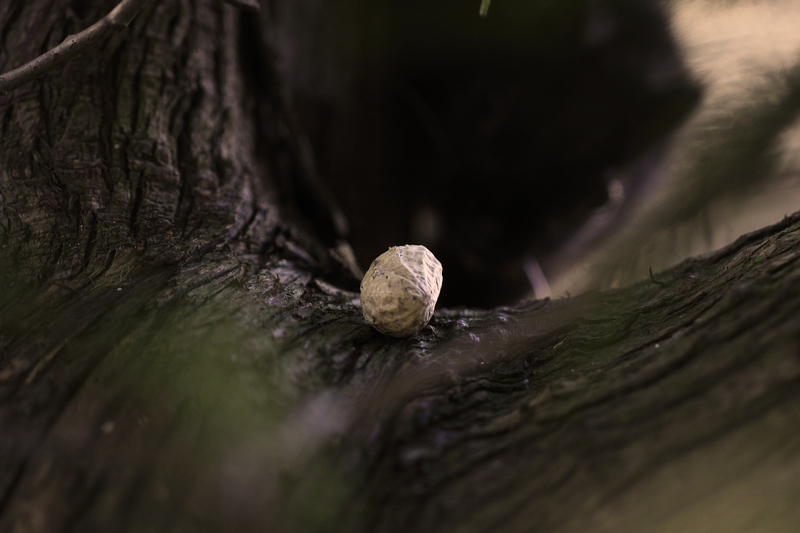 Over the weeks, I've been leaving a handful of peanuts on my way into the park and on my way back again. Spoiled much? 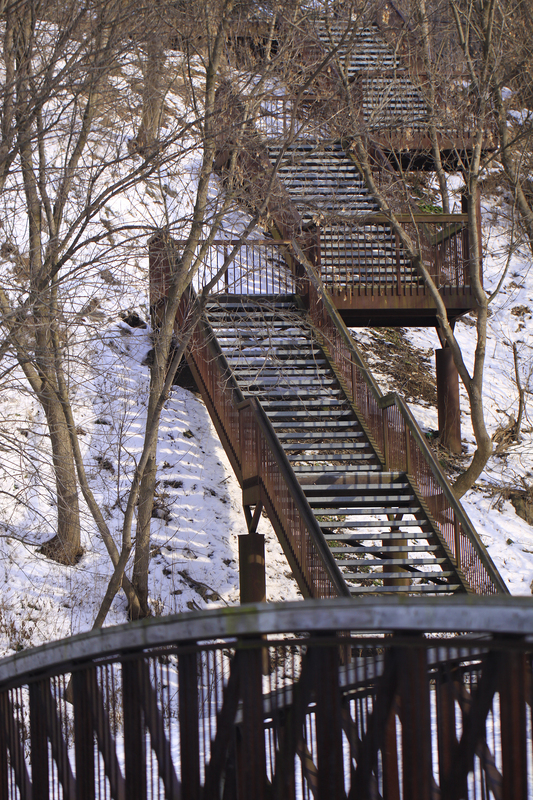 The bridge in the foreground crosses the creek and leads to those stairs which take you into town - just in case you were curious about where they go. 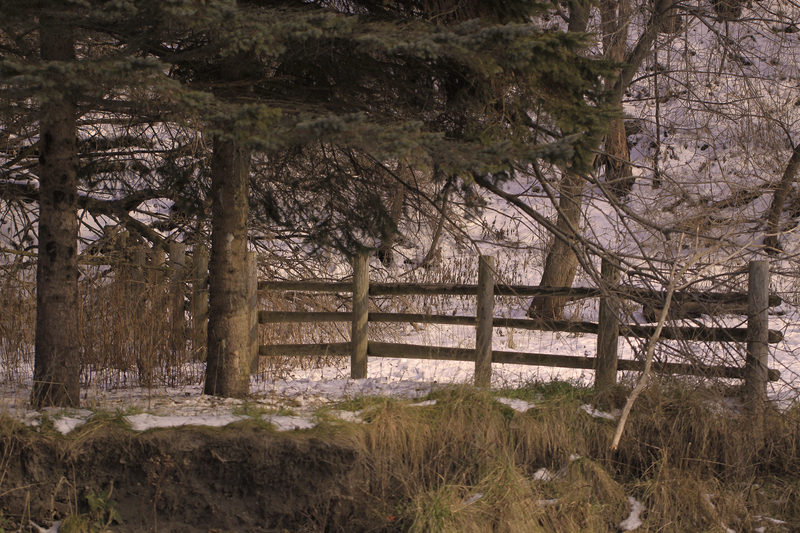 A simple fence on the other side of the creek. 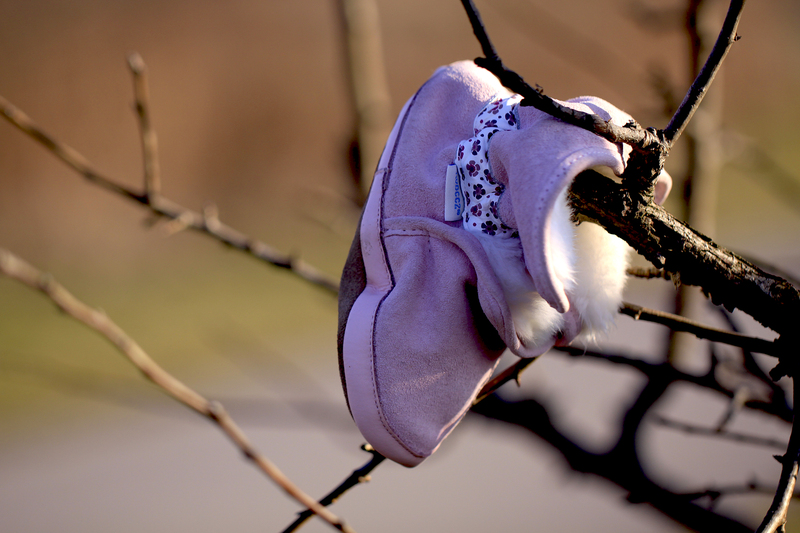 A cute little girlie foot was missing this pink shoe. Someone had placed it on the tree branch in hopes of it being reunited with the tootsie in question. I hope you enjoyed the stroll and the findings. More photos coming up soon. 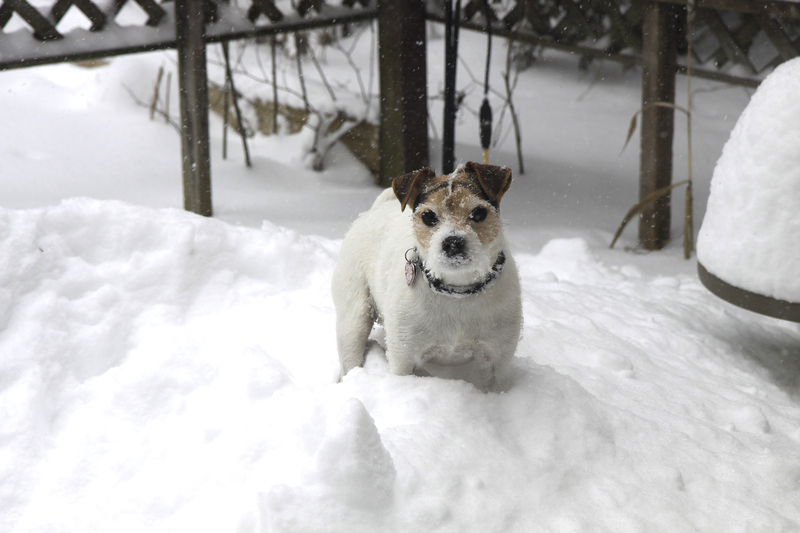 So are you sick of snow yet? Well I am. Or rather I would be if we still had a significant amount. We don't have too much left but these photos were taken when we did. I hope you enjoy them even if you're sick of the white stuff. 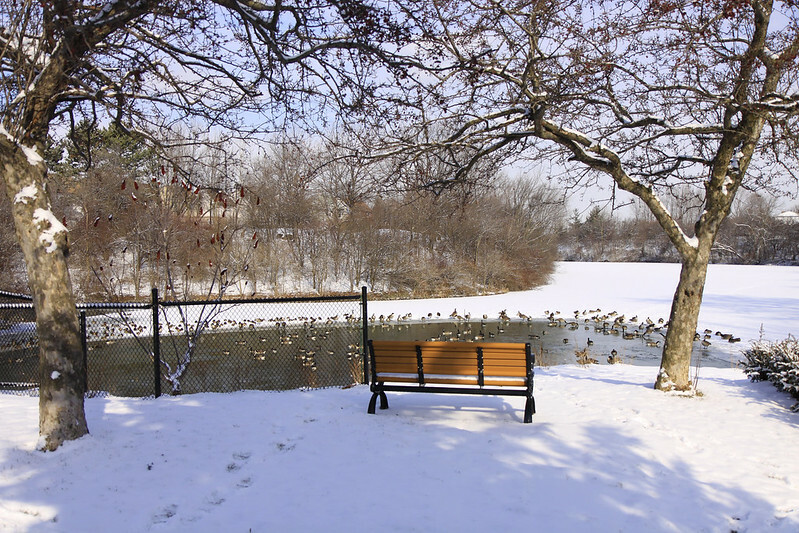 One of the new park benches installed last autumn overlooks the partially-frozen, fowl-filled pond. Say that three times fast! 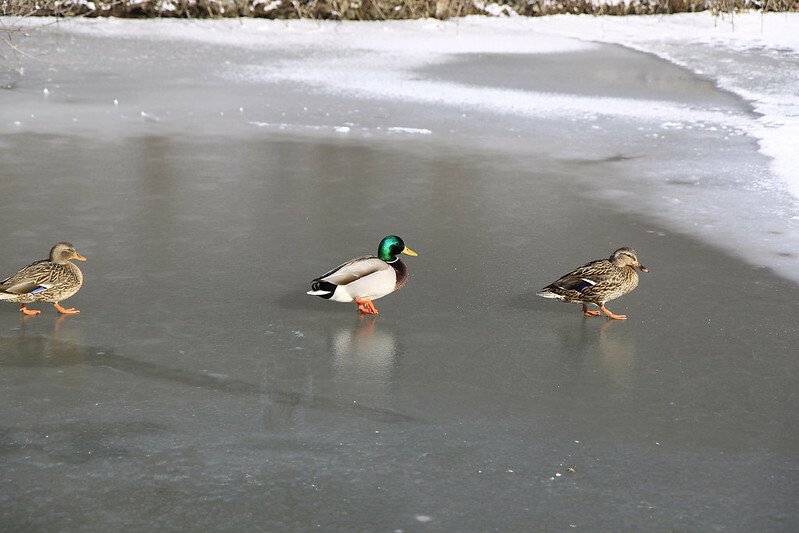 Impressive little mallards look as if they're walking on water. 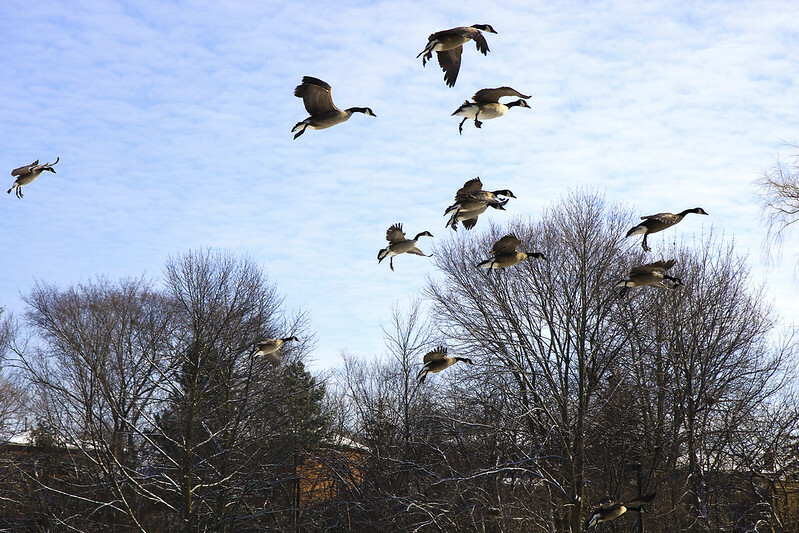 Incoming geese! Sorry, mallards but you can't have the whole pond to yourselves. 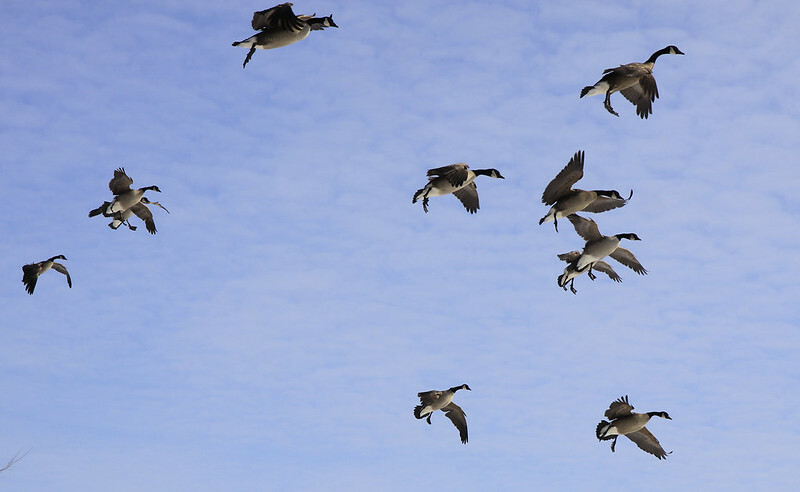 Don't they kind of look as if someone just tossed them all into the air? 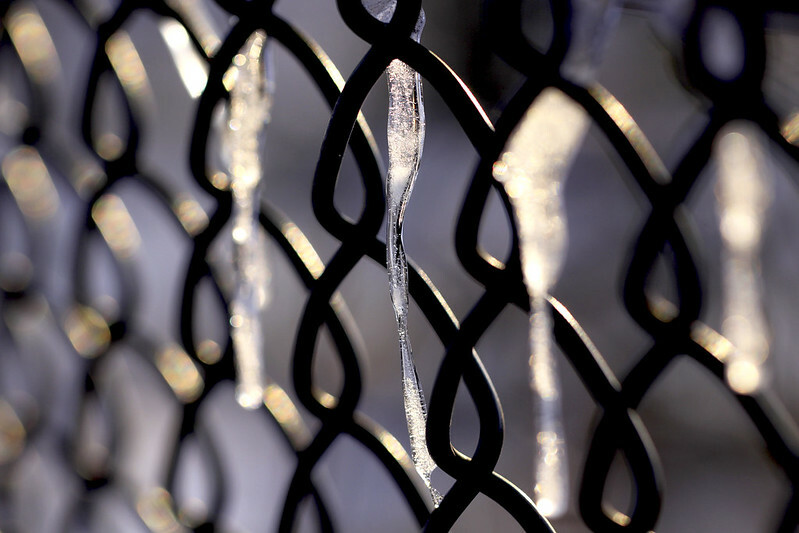 These fence-cicles keep catching my eye, this winter. 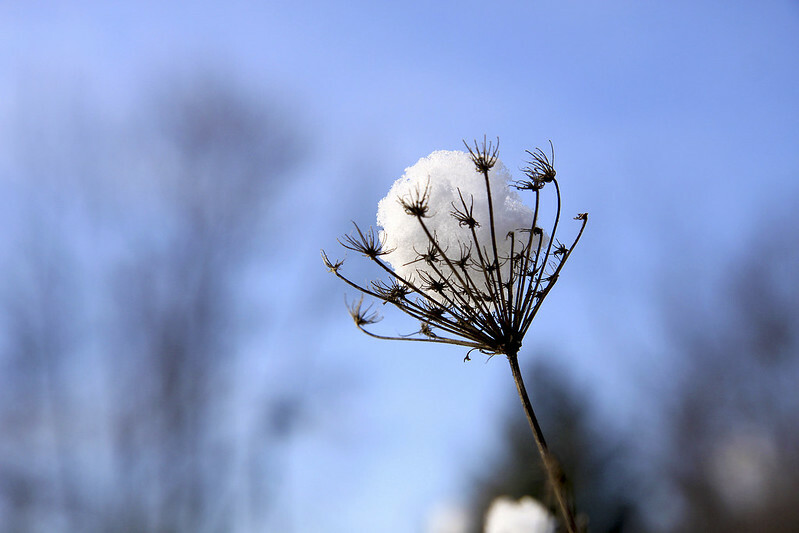 No matter the season, Queen Anne's Lace always has my attention. This snow cap is keeping her warm until her milky petals can take over in the warmer part of spring. Back in Frank's neck of the woods, you can see how the snow has helped to disguise those ice blocks. 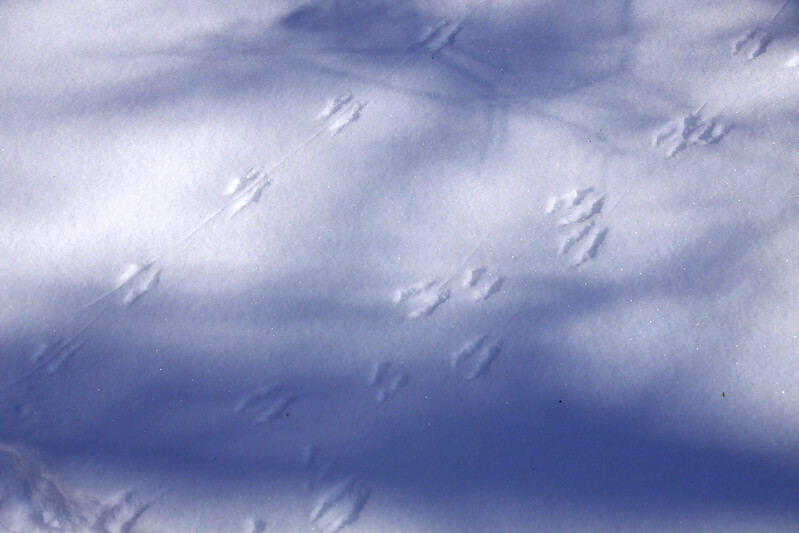 They're still there - just a little bit buried. 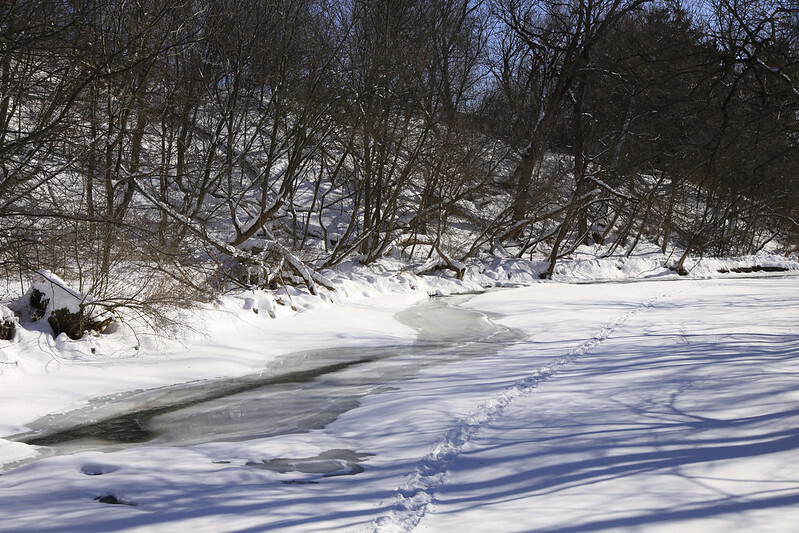 The creek's surface is completely frozen over in some parts, but you can still see the water rushing just beneath its icy veneer. It's much too early to see caterpillars around here but I thought this little patch of snowy ice did a fine imitation of one. 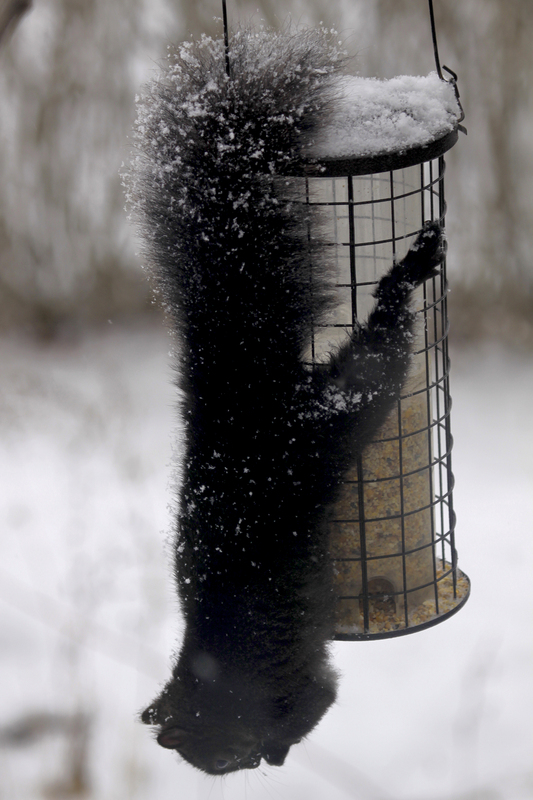 Ya gotta love the tenacity of squirrels. And here's Mr. Tenacity himself. 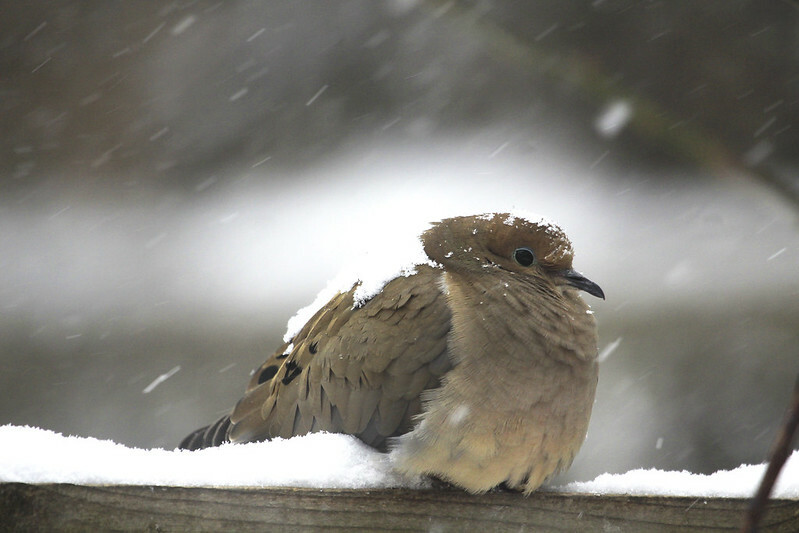 I hope you enjoyed the snowy outing. More photos coming up soon. Just for today, no photos. I'm going to focus (no pun intended) on the Posts of the Week. I'll have some images for you coming up real soon though! 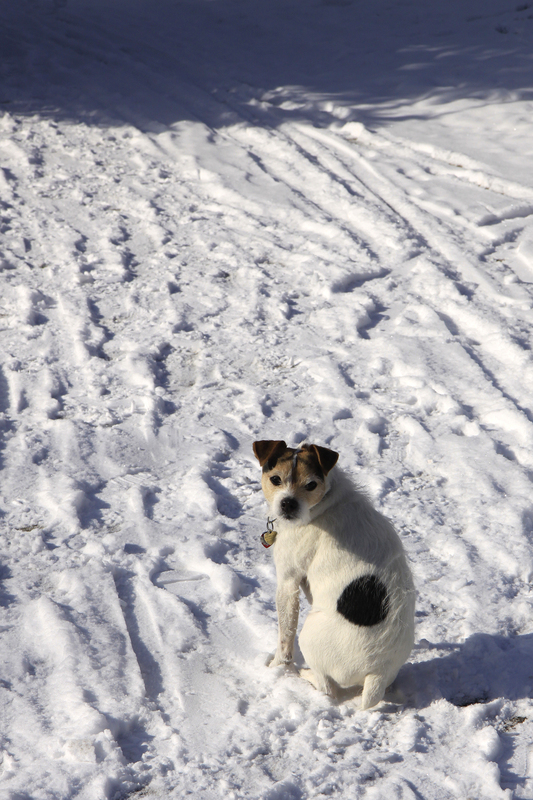 Bundle up folks, we're going to take Benny for a walk through the snow-covered paths. 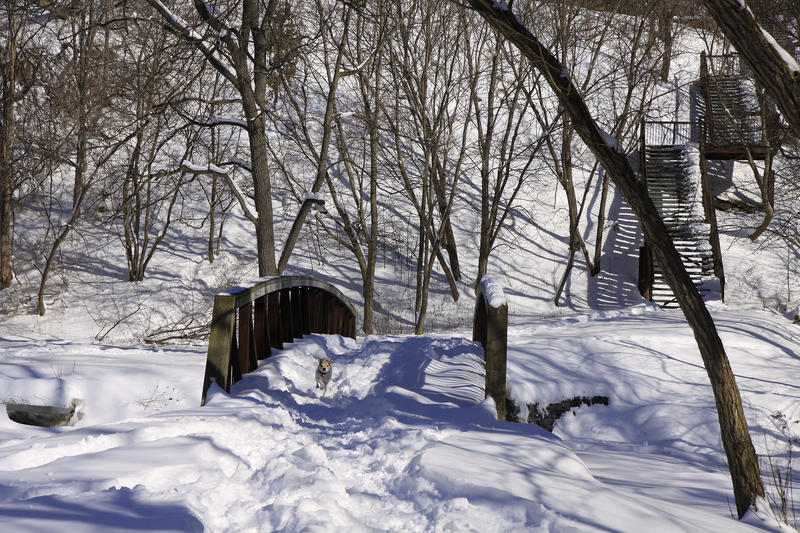 This walkway near Frank's place never sees a plow through winter so snow, ice, slush and puddles are all over the place depending on the season and the weather. 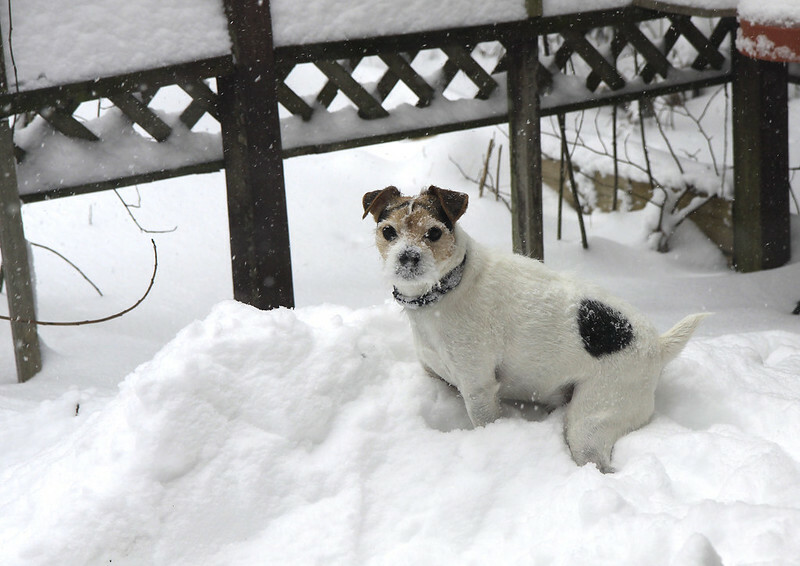 As of today, most of the white stuff is in the process of doing some serious melting but on this day, we had a fresh snowfall and in some places, it was about as deep as Benny is tall. Come join us and see for yourself. Benny waits patiently on a well-worn part of the path. 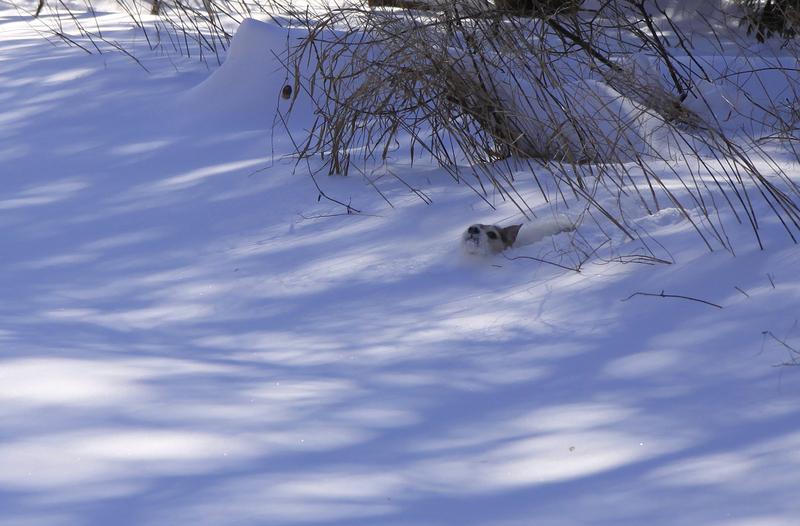 Sometimes, his black spot is the only thing visible when he's far ahead in the snow. Are we not moving along quickly enough for you, bud? Even though he knows we're not crossing the bridge, he tries to convince us that we're heading in that direction. At least he comes running back when I tell him we're not going that way. Can you give a guy a little privacy, please? This was one time that I was not going to follow him out there to pick up after him. It was far enough off path that it wouldn't be a problem come the melt. 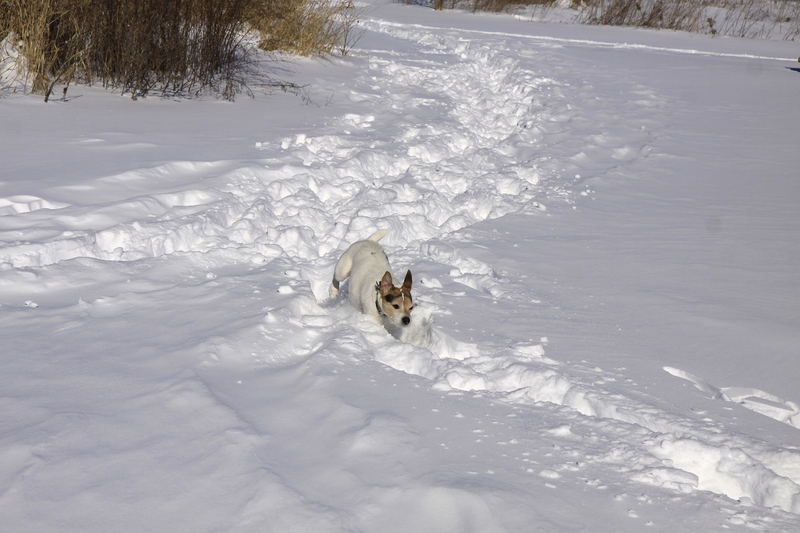 Back home again - Benny just doesn't get enough of snow play. 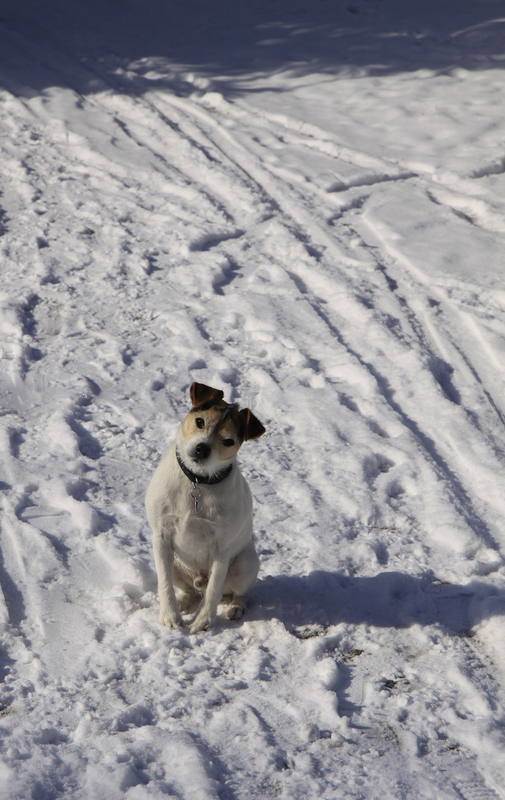 Well, aren't you going to throw snowballs for me? I hope you enjoyed our walk with Benny. Thanks for joining us. This month, after 82 years, the last of 220 Zellers department stores across Canada will be closing their doors. Millions of shoppers and thousands of past and present associates are sad to see its demise. When they opened their doors in 1931, it was promoted as "stores for thrifty people," and over forty years later, it became an important part of my life. It wasn't the shopping aspect that meant so much to me. Their head office in Montreal was my employer for almost a decade, and throughout that time, there were some wonderful years. We employees were a pretty close-knit group and the company did much to help keep spirits high. Each of the seven floors had one staff member who was a BRC (Better Relations Committee) member. Together, they would plan several events during the course of the year including car rallies, sugaring off parties (maple syrup runs), dances, the annual Christmas party and the seasonal events which helped pay for it all - the sample sales. A few times a year, Zellers buyers would locate, collect and turn over the promotional samples they received from suppliers over the previous months. As with any department store, these items ranged from very the very small - cosmetics, sewing needles, flower seeds or women's socks to much more interesting merchandise like winter coats, televisions, sporting equipment, luggage and gold jewellery. They were laid out on long tables in the basement lunchroom, where many of our after-work parties were held. As soon as the work day was done, we would line up outside of the large room. When all was ready we were given access, and off we went in search of our great bargains - 10¢ for a bottle of shampoo, $12 coats, $15 for a tent.. and so on. It was like going on a shopping spree with 500 of your best friends. Speaking of best friends, Zellers was where my enduring friendship with Carol Anne began. Along with other friends of the time, we attended many of the above-mentioned events together - the most memorable of which were the car rallies. 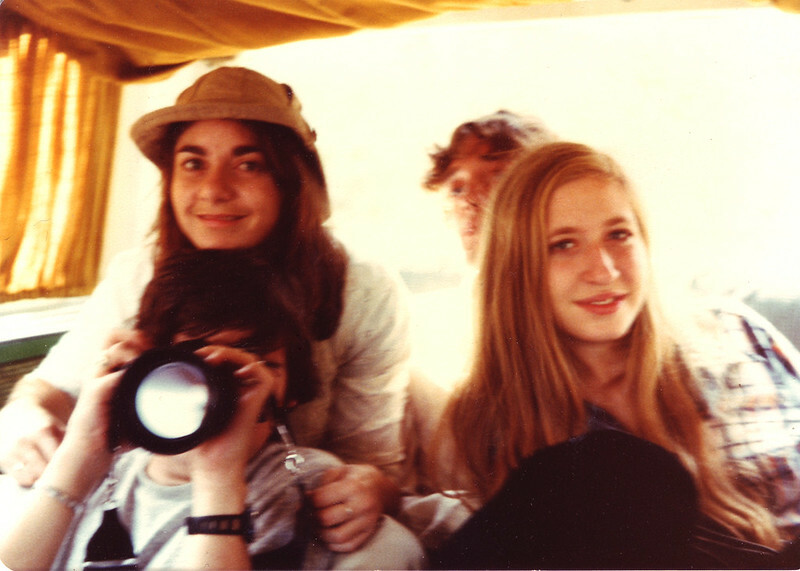 We were all pretty young at the time, and only one member of our gang had a vehicle. Derek (or Erek with a D, as we sometimes called him) was always the driver. There were usually six of us traveling in his Jimmy, and the navigator varied from one rally to the next. Carol Anne and yours truly sometime around 1978. We made a good team and typically we won or came in second but one time we came in dead last. Oh we were doing great for most of the day - passing all the right check points in good time, and figuring out the clues as we usually did. But driving along a country road, just as we passed a corn field, we succumbed to a flat tire. And there was no spare. We watched as car after numbered car passed us by while Derek and one of the others went off in search of a station to get the tire patched. The cornfield served as a nice, discreet place to hide ourselves when we females had to pee. We eventually arrived at our destination just in time to receive the booby prize which ironically, happened to be a tire pump. Since most of us had no idea where the rally actually took us, maps were handed out to find our way back to Montreal after the usual dinner and dance. I was with Zellers in '76 when Field's, an American retailer purchased a majority hold, making for some unhappy shareholders. Months later, Zellers pulled a reverse takeover instead, buying out one of Field's divisions which meant acquiring numerous stores. Our Personnel department threw a surprise celebration party for all head office employees after work that day. Champagne and wine flowed, delicious entrées and treats were served along with the biggest, most extravagant multi-tiered giant shrimp fountain I have ever seen. They knew how to party. We had regular parties or dances to celebrate whatever the calendar brought our way. Valentine's Day, St. Patrick's, the start of a season or because we just hadn't had one in a while. There was always music, wine, beer and munchies and they took place on Thursdays, after work. Every November, there was a Christmas party for employees only. Our numbers were high so it was understandable that significant others were not included. The one exception was when Zellers celebrated their 50th anniversary in 1981. For a week or two every December, we'd all be given a free half-hour at the start of the day to gather in the lunch room to sing Christmas songs. Different employees volunteered to lead the singing each day, and we got to know who would opt for which songs. And it helped that they handed out songbooks with the lyrics. 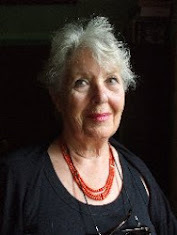 There was one buyer who sobbed every time she lead us through O Holy Night, and who had us giggling over the silliness of Suzy Snowflake - a song I had never heard before, and only heard once afterwards but will always remember note for note. One of the most important life changes happened for me while I worked for Zellers. For the first several years, I handled a block of suppliers for their Accounts Payable department. One of those suppliers was a small company called K.D.F. Industries whose nearby factory was run by Don. He came to collect his business cheque one day, took me to lunch and we married two years later. Though we have since gone our separate ways, we remain good friends and will always share the love for our two beautiful sons. Like any place, not everything was wonderful about working at Zellers. They had their share of office politics and unfair treatment, difficult bosses and supervisors who could practically get away with murder but as you can see, Zellers was good to me in many ways and I'll miss its presence very much. Bye-bye, Zellers. Thanks for the many fond memories. The following photos are unrelated to the post but I do hope you enjoy them. 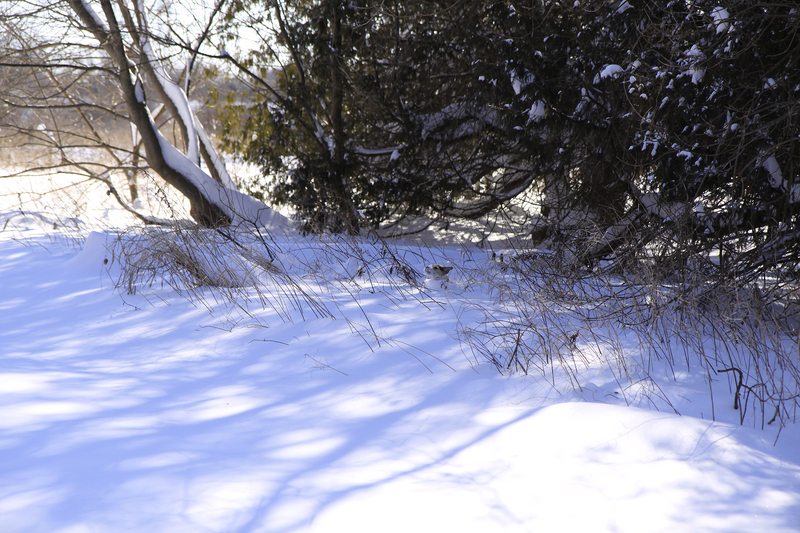 Though taken in Frank's back yard in southern Ontario, this snowfall is a little more reminiscent of Montreal winters. 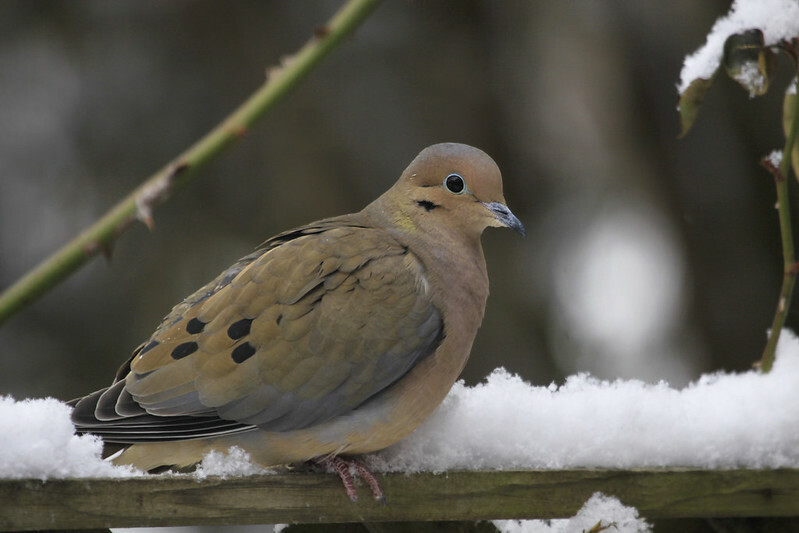 Lovely as they are, mourning doves are not the brightest birds. 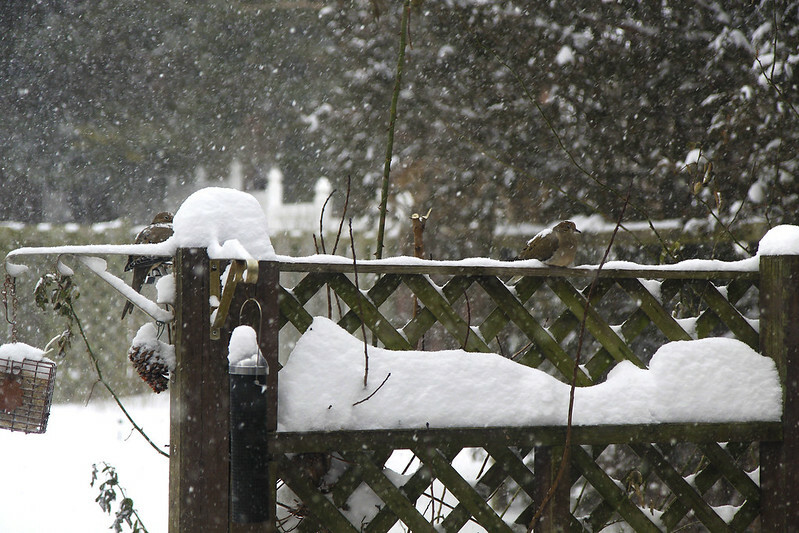 These two didn't even have the sense to find shelter from the snow. This beauty had some hunting to do. 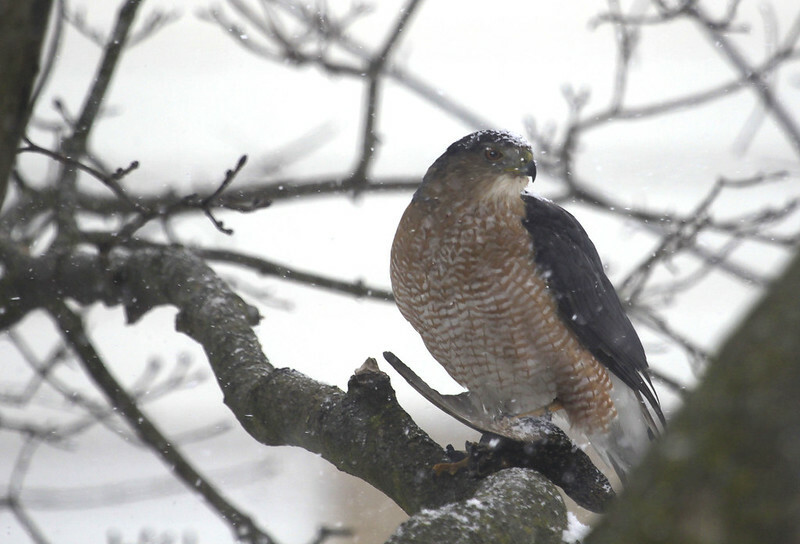 That's a starling in the hawk's talons. The next day, the sun shone bright and beautiful. I'm thinking mouse tracks - dragging that little tail behind him. Does anyone know for sure? A pristine path. Not even Benny has broken through yet. 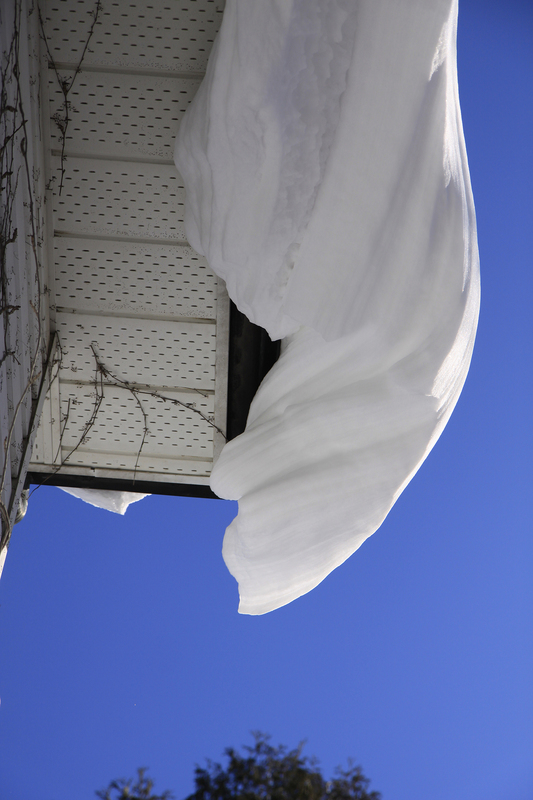 The snow on Frank's roof was like a giant soft ice cream cone about to land on its head. Or on one of ours. 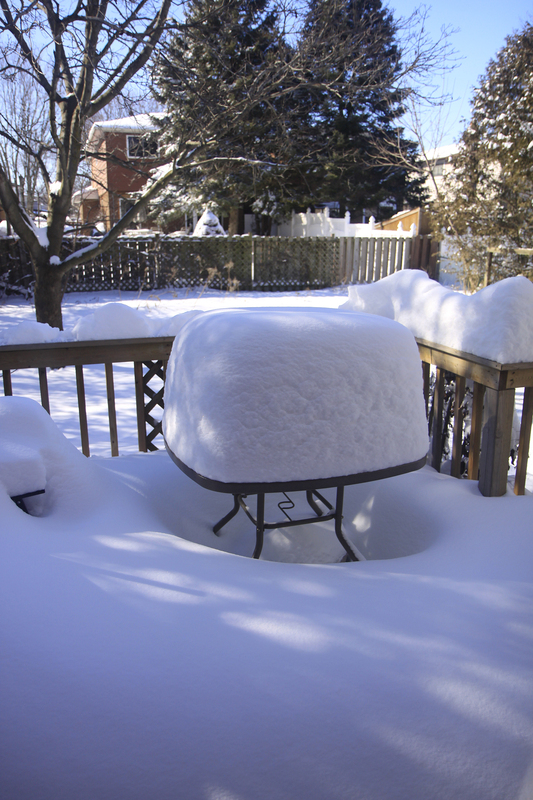 Before too long, the days will warm up and the snow will melt (in truth that table is all cleared off again by now) and we'll probably sit out there having a drink and looking forward to summer. 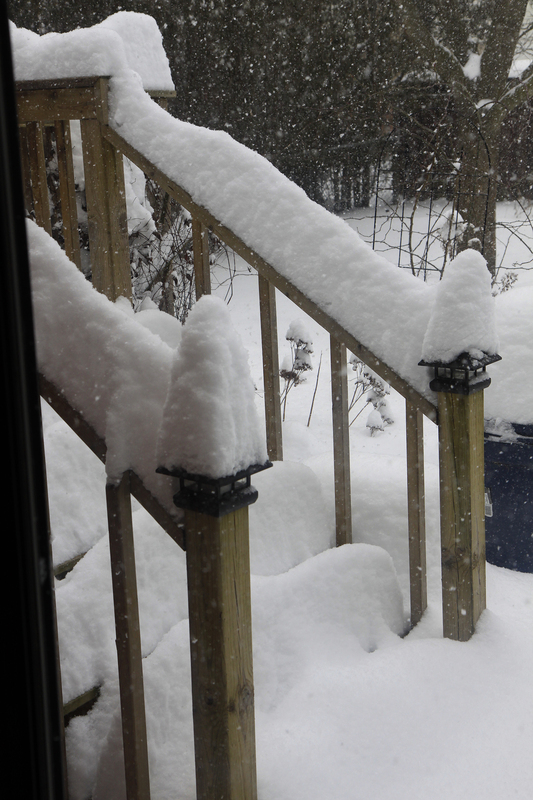 Thanks for listening to my stories about Zellers and for sharing our February snowfall. 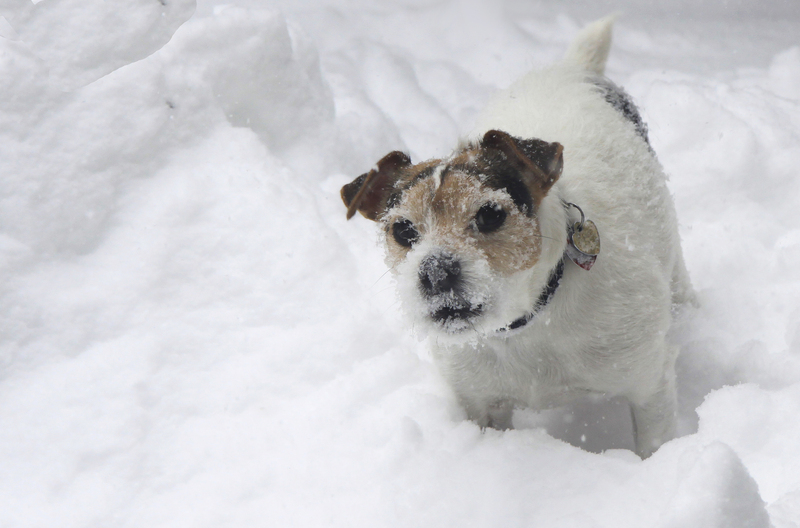 Soon, I'll have some photos of how Benny managed the deep snow.